Screenshots via Twitter user @alt_kia. Editor's note: this article was first run in June during the iOS 11 beta process. It has been updated to reflect the official release of the operating system. 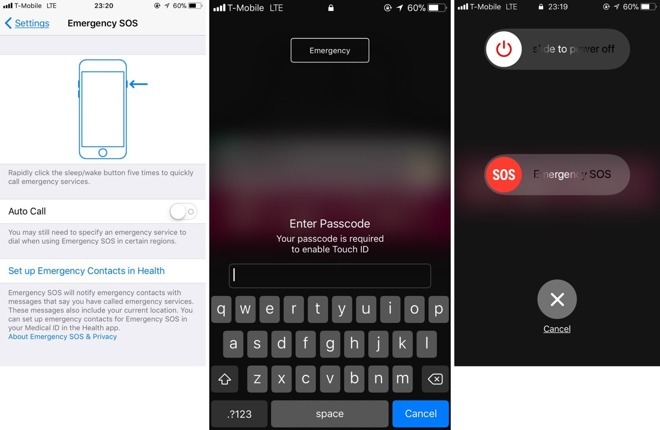 The new iOS 11 feature might allow iPhone owners who find themselves in a dangerous situation to ensure their phone cannot be forcefully unlocked with a fingerprint. It will also make it easier to contact emergency services if the person is in danger or threatened. To access it, in iOS 11, a user must just press the lock/power button five times quickly. Pressing five times does not automatically dial 911, but it presents the user with an option to do so. The new security feature also temporarily disables Touch ID, requiring users to enter a passcode to unlock their device. This would prevent a would-be thief or attacker from forcing a user's fingerprint onto the iPhone's home button to unlock it. Previously, a user would need to completely restart their phone, or to purposefully attempt to unlock multiple times with an unrecognized finger, to have a password be required on demand. For more on the new features included with iOS 11, see AppleInsider's ongoing Inside iOS 11 series.